Returning from Iowa City today, I crossed a swollen Cedar River. The boundaries between field and stream had long disappeared. Once home, I went to take flood pictures of ‘The Rock’. Between the Ben Franklin Store and the river I met a mom and some kids doing the same. A TV cameraman in a winter jacket prepared to shoot video footage of a young newsperson with a row of homes surrounded by water in the background. Then I spotted a man in a row boat paddling toward the parking lot–I recognized him. It was Buck, a member of my congregation and self-professed ‘river rat’. When it floods, Buck and Coralee know to move the furniture upstairs and get out their waders. He and his neighbors park their vehicles on dry land and use waders, or Buck’s row boat, to get to their cars. It works for them. Since moving to Moline, I’ve met a number of ‘river rats’, people who have grown-up on the river or have chosen to make the water’s edge their home. Most days, there are great advantages including: recreation, wild-life, and amazing views. When the waters rise, they know the drill and adapt. My name is Jacqueline Perry. I am an artist and a pastor serving a congregation in the Midwest. In addition to my usual duties I lead art workshops as a way to explore lives of faith. Before I was ordained, I received an M.F.A in Painting from Boston University. I have been an art teacher and exhibited work over the years. Living on the Great Plains has awakened my love for nature. I am amazed by nature, art and people. 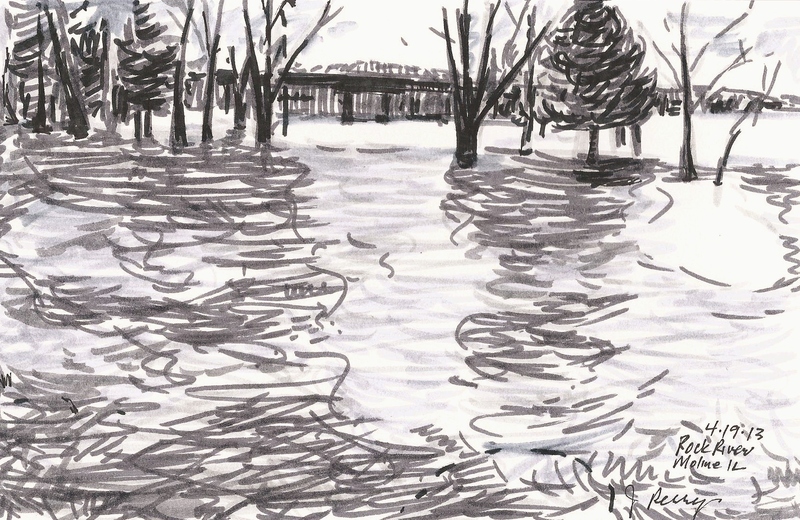 This entry was posted in Spring Diary and tagged Art, blog, Cedar River, drawing, faith, flooding, inspiration, Iowa City, Jacqueline Perry, Moline, Nature, Nature Explore, river rat, Rock River, sketch book, Spiritual, spiritual practice. Bookmark the permalink. This is an awesome sketch! Do you have to deal with flooding every year? I don’t think that I could, I can see why people would accept the tradeoff.